We are almost at the end of another year. Undoubtedly, we came across amazing research and review articles in this year. 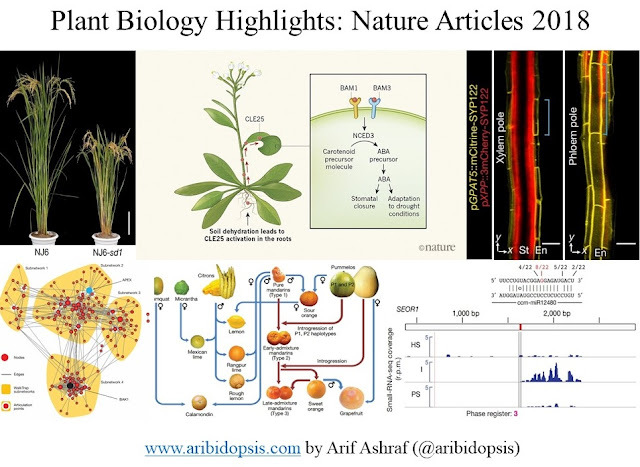 As plant biologists, we are more focused on plant-specific journals. Along with those plant-specific journals, plant-related stories are making their place into other journals too. 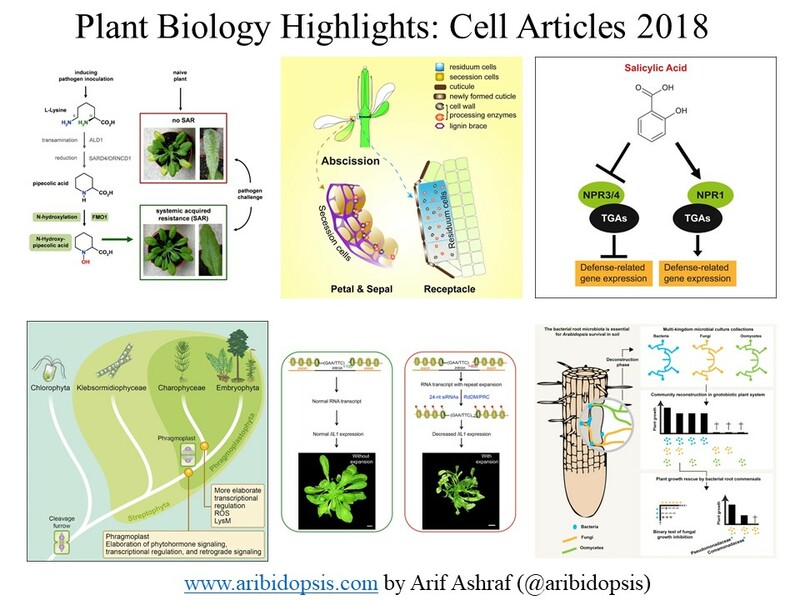 Like previous years, this year also, I'm covering plant biology stories published in Cell, Science, and Nature all the year round. In this post, you'll find published papers from Cell. 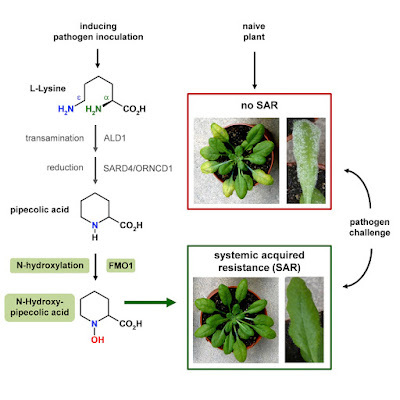 Following a previous microbial inoculation, plants can induce broad-spectrum immunity to pathogen infection, a phenomenon known as systemic acquired resistance (SAR). SAR establishment in Arabidopsis thaliana is regulated by the Lys catabolite pipecolic acid (Pip) and flavin-dependent-monooxygenase1 (FMO1). Here, we show that elevated Pip is sufficient to induce an FMO1-dependent transcriptional reprogramming of leaves that is reminiscent of SAR. In planta and in vitro analyses demonstrate that FMO1 functions as a pipecolate N-hydroxylase, catalyzing the biochemical conversion of Pip to N-hydroxypipecolic acid (NHP). NHP systemically accumulates in plants after microbial attack. When exogenously applied, it overrides the defect of NHP-deficient fmo1 in acquired resistance and acts as a potent inducer of plant immunity to bacterial and oomycete infection. 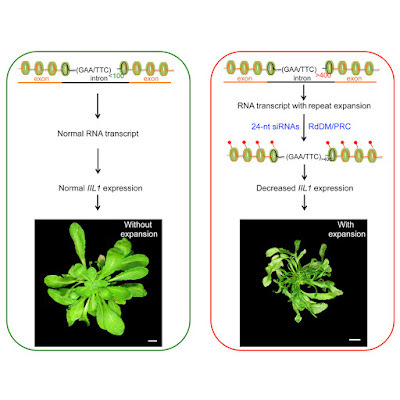 Our work has identified a pathogen-inducible L-Lys catabolic pathway in plants that generates the N-hydroxylated amino acid NHP as a critical regulator of systemic acquired resistance to pathogen infection. 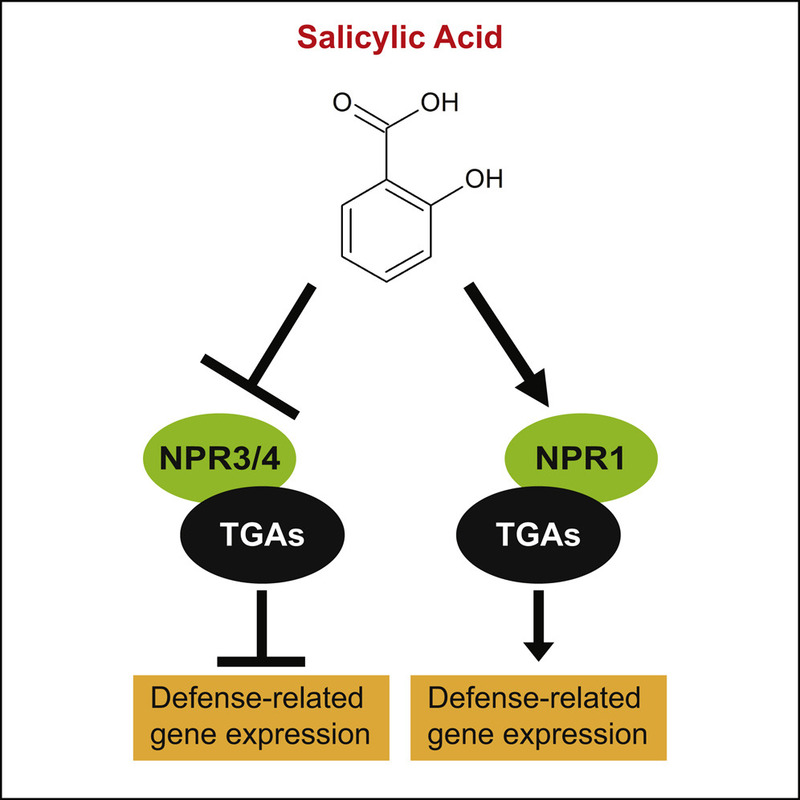 Salicylic acid (SA) is a plant defense hormone required for immunity. Arabidopsis NPR1 and NPR3/NPR4 were previously shown to bind SA and all three proteins were proposed as SA receptors. NPR1 functions as a transcriptional co-activator, whereas NPR3/NPR4 were suggested to function as E3 ligases that promote NPR1 degradation. Here we report that NPR3/NPR4 function as transcriptional co-repressors and SA inhibits their activities to promote the expression of downstream immune regulators. npr4-4D, a gain-of-function npr4 allele that renders NPR4 unable to bind SA, constitutively represses SA-induced immune responses. In contrast, the equivalent mutation in NPR1 abolishes its ability to bind SA and promote SA-induced defense gene expression. Further analysis revealed that NPR3/NPR4 and NPR1 function independently to regulate SA-induced immune responses. Our study indicates that both NPR1 and NPR3/NPR4 are bona fide SA receptors, but play opposite roles in transcriptional regulation of SA-induced defense gene expression. The cell wall, a defining feature of plants, provides a rigid structure critical for bonding cells together. To overcome this physical constraint, plants must process cell wall linkages during growth and development. However, little is known about the mechanism guiding cell-cell detachment and cell wall remodeling. Here, we identify two neighboring cell types in Arabidopsis that coordinate their activities to control cell wall processing, thereby ensuring precise abscission to discard organs. One cell type produces a honeycomb structure of lignin, which acts as a mechanical “brace” to localize cell wall breakdown and spatially limit abscising cells. The second cell type undergoes transdifferentiation into epidermal cells, forming protective cuticle, demonstrating de novo specification of epidermal cells, previously thought to be restricted to embryogenesis. 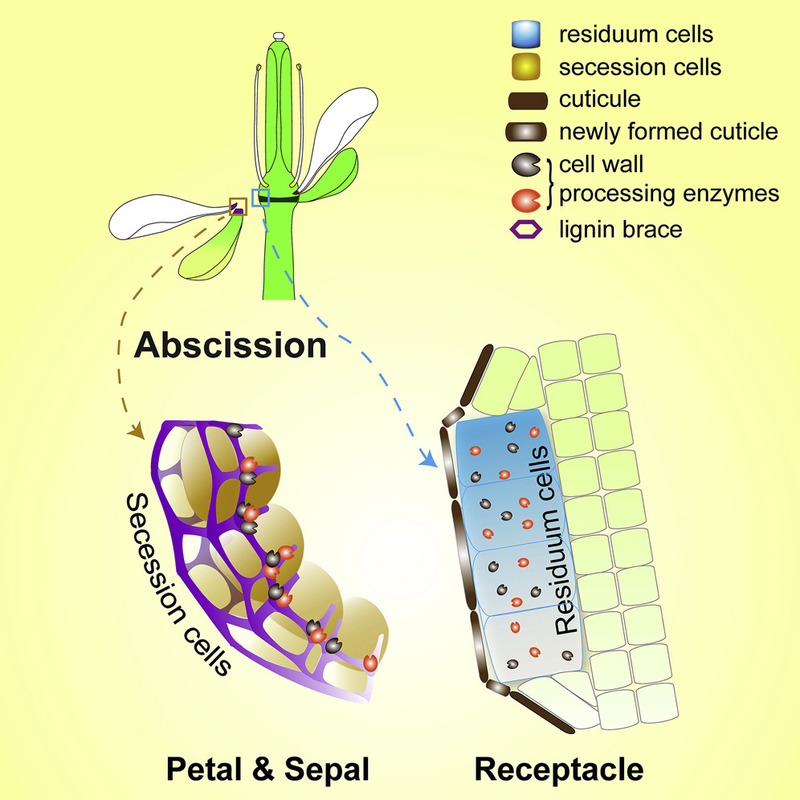 Loss of the lignin brace leads to inadequate cuticle formation, resulting in surface barrier defects and susceptible to infection. Together, we show how plants precisely accomplish abscission. Land plants evolved from charophytic algae, among which Charophyceae possess the most complex body plans. We present the genome of Chara braunii; comparison of the genome to those of land plants identified evolutionary novelties for plant terrestrialization and land plant heritage genes.C. braunii employs unique xylan synthases for cell wall biosynthesis, a phragmoplast (cell separation) mechanism similar to that of land plants, and many phytohormones.C. 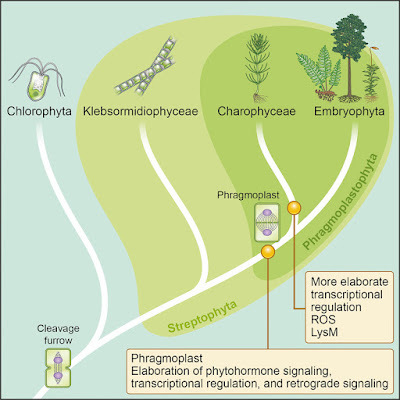 braunii plastids are controlled via land-plant-like retrograde signaling, and transcriptional regulation is more elaborate than in other algae. The morphological complexity of this organism may result from expanded gene families, with three cases of particular note: genes effecting tolerance to reactive oxygen species (ROS), LysM receptor-like kinases, and transcription factors (TFs). 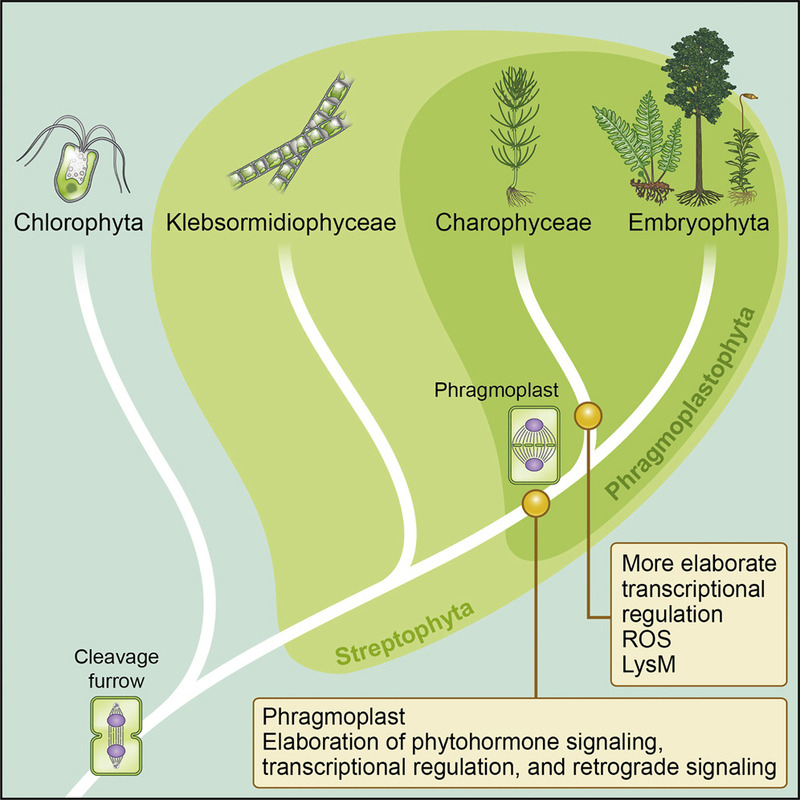 Transcriptomic analysis of sexual reproductive structures reveals intricate control by TFs, activity of the ROS gene network, and the ancestral use of plant-like storage and stress protection proteins in the zygote. Transcriptional downregulation caused by intronic triplet repeat expansions underlies diseases such as Friedreich’s ataxia. This downregulation of gene expression is coupled with epigenetic changes, but the underlying mechanisms are unknown. Here, we show that an intronic GAA/TTC triplet expansion within theIIL1 gene of Arabidopsis thaliana results in accumulation of 24-nt short interfering RNAs (siRNAs) and repressive histone marks at the IIL1 locus, which in turn causes its transcriptional downregulation and an associated phenotype. Knocking down DICER-LIKE-3 (DCL3), which produces 24-nt siRNAs, suppressed transcriptional downregulation of IIL1 and the triplet expansion-associated phenotype. Furthermore, knocking down additional components of the RNA-dependent DNA methylation (RdDM) pathway also suppressed both transcriptional downregulation of IIL1 and the repeat expansion-associated phenotype. Thus, our results show that triplet repeat expansions can lead to local siRNA biogenesis, which in turn downregulates transcription through an RdDM -dependent epigenetic modification. 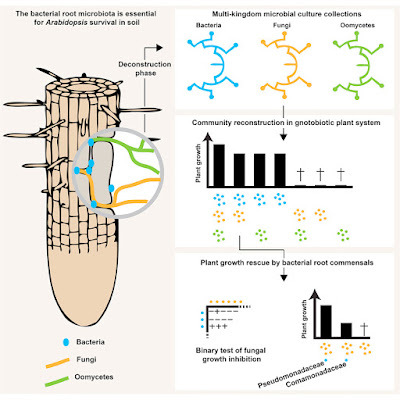 Roots of healthy plants are inhabited by soil-derived bacteria, fungi, and oomycetes that have evolved independently in distinct kingdoms of life. How these microorganisms interact and to what extent those interactions affect plant health are poorly understood. We examined root-associated microbial communities from three Arabidopsis thaliana populations and detected mostly negative correlations between bacteria and filamentous microbial eukaryotes. We established microbial culture collections for reconstitution experiments using germ-free A. thaliana. 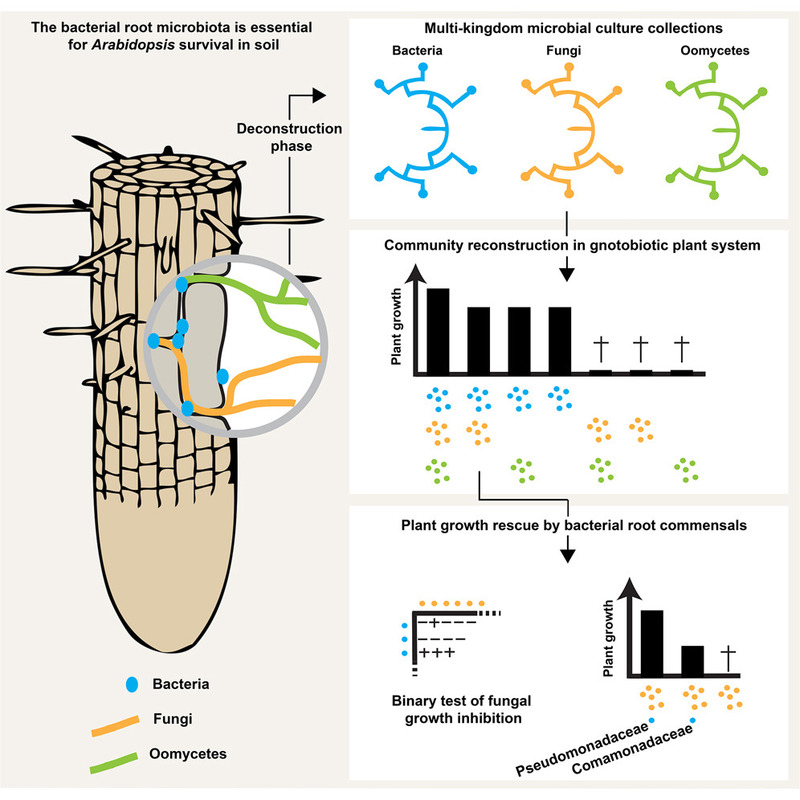 In plants inoculated with mono- or multi-kingdom synthetic microbial consortia, we observed a profound impact of the bacterial root microbiota on fungal and oomycetal community structure and diversity. We demonstrate that the bacterial microbiota is essential for plant survival and protection against root-derived filamentous eukaryotes. Deconvolution of 2,862 binary bacterial-fungal interactions ex situ, combined with community perturbation experiments in planta, indicate that biocontrol activity of bacterial root commensals is a redundant trait that maintains microbial interkingdom balance for plant health. For the similar post of 2017, follow the link below.